Native to India and grown as an annual here, ashwagandha is one of the most revered herbs in Ayurvedic medicine for its’ wide ranging health benefits. The name ashwagandha is from the Sanskrit language meaning “smell of the horse,” perhaps due to its strong odor or its invigorating properties. Ashwagandha is used in a similar way as ginseng is used in Asia. It is an excellent adaptogenic herb and increases the body’s overall ability to adapt to and resist stress. Although often considered to be a male sexual tonic, it is useful for women as well, acting specifically thru its tonifying effects on the reproductive systems. Ashwagandha strengthens and invigorates, increasing performance and fertility. It helps restore strength and vigor to those lacking in energy and general debilitation. In India it is used to promote intelligence and memory, in particular following head injury or in old age. Ashwagandha is believed to be a mood stabilizer for clinical anxiety and depression and has analgesic properties that soothe the nervous system. It may be used during and after radiation therapy as it significantly increases white blood-cell counts. Ashwagandha is one of our favorite farm plants for winter support and deep immune strengthening. A powerful building and strengthening plant, ashwagandha has been highly esteemed and revered for centuries in it’s native land of India, and is rapidly gaining recognition here in the west as it’s remarkable qualities become known. The medicine is in the roots. It builds energy and stamina, supports healthy sleep, and is a strong anti-inflammatory specifically indicated for arthritis. Also supportive of immune function, ashwagandha is antimicrobial, antiseptic and a deep immune rejuvenator. Boil one teaspoon of dried root in 1 cup of water, then bring to a simmer for 20 to 45 minutes. Drink two to three cups a day. 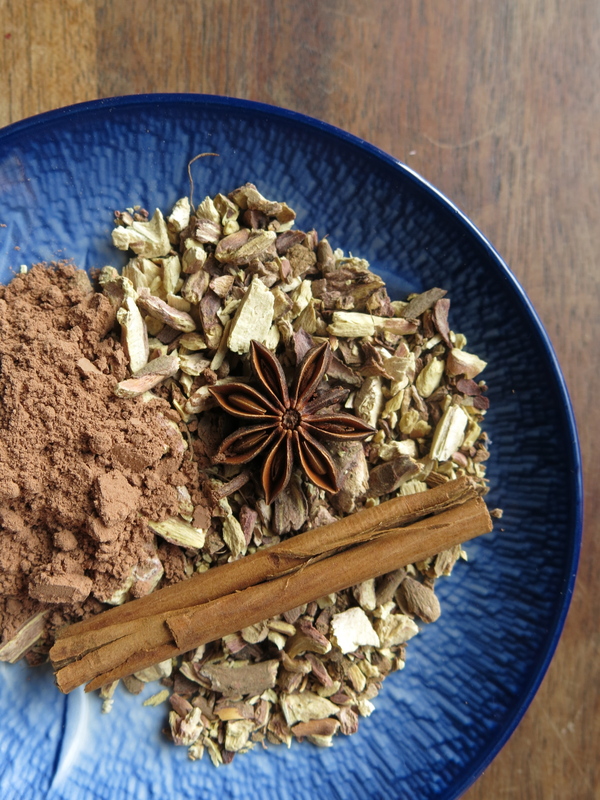 Powder the root (with a coffee grinder if possible or a vitamix) and blend with more flavorful herbs, such as cinnamon and ginger to make a tasty tea and combine with milk or almond milk for a more traditional Indian drink. Tincture the dried roots and take 1/4 teaspoon, three times a day. The powdered root can be mixed with ghee or honey. 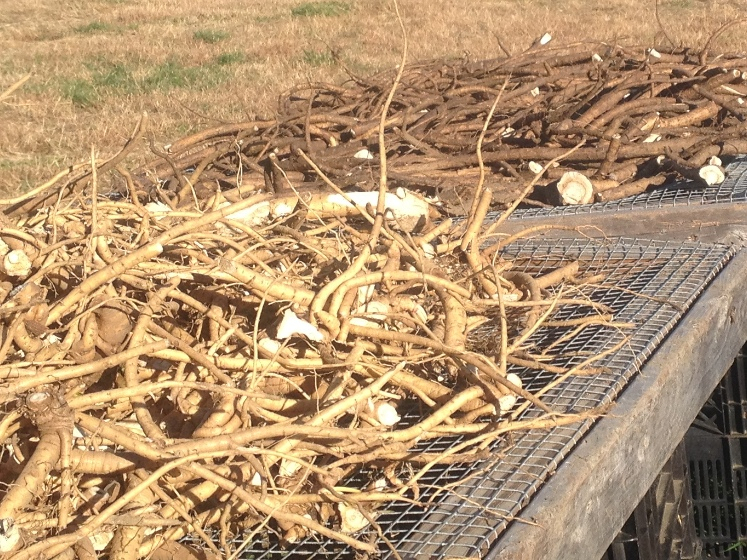 Cut your fresh root into pieces and dry, preferably with a dehydrator. The pieces become very hard when dried well. The paste formed when roots are crushed with water is applied to reduce joint inflammation. Ashwagandha Cocoa is a perfect warm up on chilly fall mornings. 2 Tbsp ashwagandha root, 4 Tbsp raw cocao powder, 1 stick cinnamon, 1-2 pieces of star anise, 1-2 tbsp honey or maple syrup. In a small saucepan bring to boil one quart of water. Add ashwagandha and simmer for 15-30 minutes. Add cinnamon and star anise, let simmer for another couple of minutes more then remove from heat and let steep, covered for 15 minutes. Strain out herbs and whisk in cacao powder and sweetener. Pour into your favorite mug, breath deep, and enjoy! For a more bitter brew try adding dandelion root or chaga mushroom. Use 1 tbsp of each and simmer along with ashwagandha. Ashwagandha is not recommended during acute infections or for a person with severe congestion. It is best not to use during pregnancy and avoid if you have an allergy or sensitivity to plants in the nightshade family (ie tomato, eggplant).